Veterans Affairs Agency Looks To Alternative Therapies To Ease Pain : Shots - Health News In hopes of reducing some veterans' reliance on pills for physical pain and psychological trauma, the U.S. Department of Veterans Affairs is taking a look at alternative therapies. "Cloudy hands to the right, cloudy hands to the left," he tells them. "Now we're going to open your arms, grab the wheels and 180-degree turn." The participants swivel about-face and continue to the next pose. Guo, a medical anthropologist at the University of Tennessee at Chattanooga, has modified his tai chi to work from a seated position. Even though many of the participants aren't in wheelchairs, using the mobile chairs makes it easier for them to get through a half-hour of movement. The U.S. Department of Veterans Affairs has given $120,000 in grant money to Guo to spread his special wheelchair tai chi curriculum. He started in Chattanooga, and has expanded his class offerings to Murfreesboro. This idea of going beyond prescriptions — and especially beyond opioids — in dealing with different sorts of pain and trauma has become a focus of the VA nationally. In Tennessee, nearly a quarter of all VA patients with an active medical prescription were on opioids in 2012. That number is now down to 15 percent, but that's still higher than in most other parts of the country. According to a national survey from 2015, nearly every VA hospital now offers some kind of alternative health treatment — like yoga, mindfulness and art therapy. 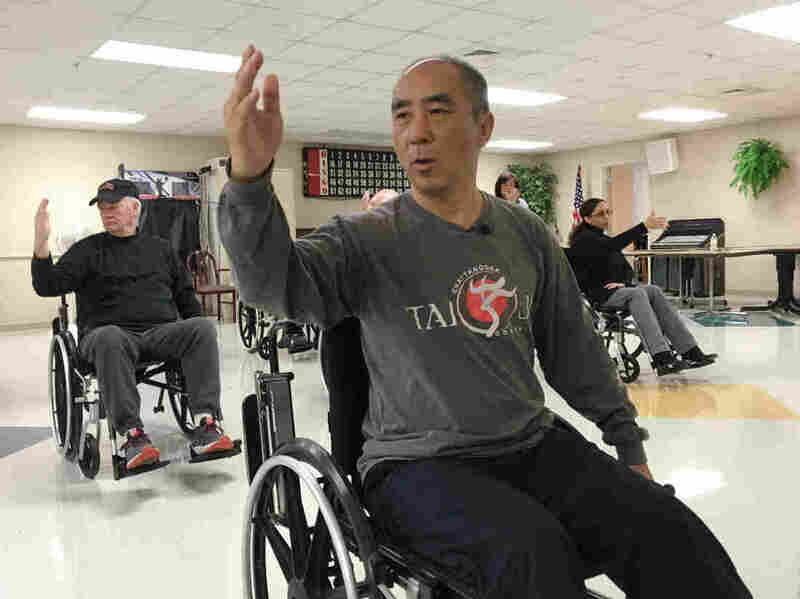 Guo is teaching people in a half dozen VA hospitals in Florida, Texas, Utah and Arizona to use his version of tai chi. He believes the focus on breathing and mindfulness — paired with manageable physical activity — can help ease a variety of ailments. "When you have a good amount of body harmony, people tend to engage in proactive life," he says, "so that helps with all kinds of symptoms." In addition to making a vet feel better physically, the VA also hopes these alternative therapies might help ease symptoms of conditions like post-traumatic stress disorder. Medical anthropologist Zibin Guo (center) adapted tai chi for people with limited mobility. Though there's little research evidence confirming that tai chi eases drug cravings or symptoms of post-traumatic stress, the veterans in Guo's class say the program helps them. Thomas Sales, of Nashville, Tenn., says his latest panic attack caught him by surprise. "Night before last, when we had the thunderstorm," he says. "The thunder is a big trigger for some people." It's been 25 years after Sales fought in the first Gulf War with the Navy Special Warfare Command, and he still has panic attacks regularly. "You'll find yourself flashing back to being out there with the fellas, and you'll just kind of snap," he says. "And I found myself, for some reason, thinking about doing the breathing techniques [from tai chi], and doing the 'heaven and earth,' and then breathing deep and slow." Sales says he knows it must look crazy to some people when he reaches to the sky and then sweeps his arms to the ground. There was a time when he would have agreed. Most of the patients in this class had some skepticism going into the tai chi program. But Vietnam veteran Jim Berry of Spring Hill, Tenn., says he's now convinced of its value. "My daughter sent me a t-shirt that sums it up," he says. "Tai chi is more than old folks chasing trees." Berry credits meditation and tai chi with helping him quit smoking. "No cigarettes for three months now," he says. Zarita Croney, a veteran with the National Guard, says tai chi has helped her with chemical dependency. She now makes the nearly two-hour drive from Hopkinsville, Ky., to Murfreesboro each week, and has reduced her use of pills for pain. "My whole life ... revolved around, 'Oh shoot, when can I take my next pill?' " Croney recalls. "I've gone from about 90 percent of my day being on my bed to being able to come out and be social." The VA has been aggressively trying to wean vets off high-powered opioids — using prescription data as a key measurement to judge how its hospitals across the country are doing with that goal. The VA acknowledges that there's little evidence at this point that tai chi or mindfulness therapy or acupuncture will ease PTSD or addiction, though recently there has been research into the quality of life benefits of tai chi among the elderly. But physicians say they suspect many of the opioisa aren't always helping veterans either, and the drugs carry more risks. Aaron Grobengieser, who oversees alternative medicine at the VA hospital in Murfreesboro, says tai chi won't replace medication. But it might help reduce prescriptions, and the agency plans to start measuring that. "I believe this is going to be an avenue," he says, "to really help address that group of folks [who are] looking for ways to manage those types of conditions without popping another pill."